The City’s Green Line team has done some amazing work this year on engaging Calgarians on this City-changing project over the past year. The Green Line has come a long way from the early days when I and my colleagues were asking our Federal colleagues to fund this project, and even then some believed it would never be a reality. We proved them wrong. Take a look at the highlights of the Green Line team, and please become involved in the engagement sessions. Each session provides new ideas and insight for the Green Line team on each communities needs, and ultimately will help define what each station will look like. 2016 has been a big year for the Green Line LRT project. We’ve had great conversations with thousands of Calgarians, continued to refine alignment options and have even begun some preliminary infrastructure improvements in the southeast. Our Green Line Ambassadors attended a variety of cultural events and community festivals over the course of the summer, enabling us to speak to more than 3,000 Calgarians! Thank you to everyone for providing your input. Your comments and suggestions have informed the team’s recommendations to Council, and have helped shape the plans for this new LRT line. On Saturday, December 3, 2016, the Government of Canada and the Province of Alberta announced funding that will bring The City of Calgary one step closer to beginning construction of the new Green Line LRT. The funding, which comes from the federal Public Transit Infrastructure Fund (PTIF) and the provincial Green Transit Incentives Program (GreenTRIP), will provide transit infrastructure funding to more than 25 municipalities across Alberta. In Calgary, the funds will help prepare the Green Line right-of-way for construction with items such as utilities and land. The Green Line north team spent most of 2016 having conversations with you to help inform more detailed planning of the Green Line on Centre Street. We had conversations with almost 2,000 of you at five station area workshops and transit oriented development workshops at Crescent Height/Tuxedo Park, 40 Avenue and 64 Avenue. All of this input is being used to help build a more refined technical plan for the Green Line north. We’ll be back in the New Year to discuss the specifics of the Green Line north alignment and station locations will go to City Council in June 2017. The north and southeast alignments were approved by City Council in 2015, and in 2016 the Green Line team worked towards Council approval of the Centre City alignment, which includes the Beltline communities, the downtown core, and the Bow River crossing. On October 4, 2016, City Council approved a fully tunneled LRT route in Calgary’s downtown core. The approval was made “in principle”, contingent on the overall funding for the Green Line program. 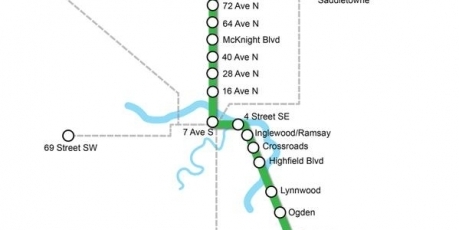 The fully tunneled route would see the Green Line LRT run underground from the CP tracks in the Beltline, under 2 Street S.W., and under the Bow River. The line would resurface at 24 Avenue N along Centre Street N.
The Beltline alignment options have recently undergone an extensive evaluation. The results of the evaluation, which includes stakeholder and public input, indicate that 12 Avenue S is the preferred corridor. On December 19, Council approved 12 Avenue S as the preferred corridor for the Green Line in the Beltline. The Green Line project team will carry two options forward for further evaluation: 12 Avenue S Surface (which sees the LRT running at street level along 12 Avenue from 2 St SW to the Inglewood area) and 12 Avenue S Tunnel + Surface (which sees the LRT running underground from 2 St SW to just east of 4 St SE, then proceeding at surface into Inglewood). This next stage of evaluation will include traffic analysis, investigation of technical considerations, and continued coordination with stakeholders to better understand future development in the area. Once further evaluation is complete, an official recommendation on alignment will be presented in Spring of 2017. The Green Line team conducted 20 public meetings and spoke with over 1,400 people in developing the Area Redevelopment Plans (ARPs) and Station Area Plan (SAP) for the TOD areas on the southeast leg of the line. The ARPs and SAP are scheduled for Calgary Planning Commission in Q1 2017. We’ll be back in the New Year with more information on the Green Line in the southeast. The Green Line team hosted four speaker series events, which featured panel discussions with subject matter experts across a variety of disciplines. During 2016, we covered a range of topics like “City-Shaping” and how the project has the potential to change entire communities along the alignment. Our second session looked at “How to build a transit village”, focusing on the transit-oriented approach to community planning. Our third session explored at how Green Line is “Shaping the way we move” and our final session looked at “Calgary’s Potential” – What will the Calgary we pass to future generations look like? There are some major project milestones coming up in the first half of 2017, including the Beltline alignment recommendation to City Council (Spring 2017), and the final, full alignment recommendation to City Council (June 2017). As we explore and refine the details of the project, we will back in the community seeking input and sharing our progress. Upcoming Green Line events will be publicized on the engage portal.